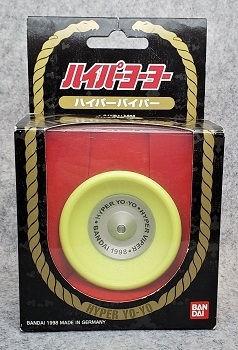 The Hyper Viper was Bandai's licensed version of the Henrys Viper. The yo-yo was made in Germany and was composed of an aluminum hub with rubber shells added to the hub. Uses a size D ball bearing axle. There is no response system. You could easily adjust the responsiveness of the yo-yo simply by rotating the halves slightly. Compare with the Henrys Viper.